History: (Nomad III#3 (fb)) - The group of Californians known as the Undergrounders became loosely affiliated with the outlaw hero Nomad, who once shook down one of the prostitute Undergrounder Legs' clients who had gotten too rough. After also getting the Undergrounder Pretty Boy out of setup involving the producer of Saturday Night, the Undergrounders' leader Horizon, who had a knack for seeing things coming, gave Nomad a tip about the Los Angeles Airport (LAX). (Nomad II#3) - After battling the U.S.Agent at LAX, the weary Nomad returned to the Undergrounders late at night, saying hello to Horizon and Pretty Boy as he entered. Legs soon appeared as well and asked about Horizon's tip, which Nomad replied that something was indeed going down at LAX but he was unable to find out exactly what. Legs then revealed that there were rumors that Nomad had quite a lengthy government file and, until the Undergrounders knew more about him other than his smart mouth, she questioned whether the Undergrounders should continue aiding his heroics. Legs then picked up the infant Bucky while Nomad sharply reminded Legs about the client trouble he had gotten her out of and the setup he gotten Pretty Boy free of. Horizon intervened, reminding Nomad that they needed a more permanent agreement but Nomad admitted that he could not fully get involved with the Undergrounders until he worked out his own issues. The Undergrounders then revealed that they had deduced that Nomad was actually a superhero after hearing that Captain America himself was looking for Nomad. Nomad quickly explained that it wasn't Captain America but U.S.Agent, who was after Nomad because of a government situation in Alaska that Nomad had earlier blew. Nomad further explained that those government problems could be over that night with the Undergrounders' help. Horizon asked how much money their help would warrant and Nomad agreed to $50, possibly more if Nomad's mission was successful. Nomad then told Horizon where the Undergrounders could meet him in one hour and Legs suggested that she stay to watch over Bucky. (Nomad II#4 (fb) - BTS) - Legs was invited to Las Vegas by her old friend Troy Donahue. She agreed to go, unaware that Nomad had followed on behalf of the Undergrounders to ensure she stayed out of harm's way. 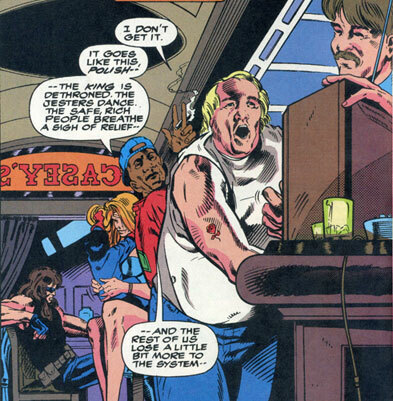 (Nomad II#4) - When Troy Donahue was attacked in a Las Vegas casino by the villain Bushwacker, Legs tried to run but was coldly knocked aside by Bushwacker, prompting Nomad to get involved. Surprised to see Nomad, Legs asked what he was doing there and said hi to the infant Bucky. Knocking Nomad aside, Bushwacker announced that Troy Donahue had taken his daughter away from his ex-wife and Troy's ex-wife happened to be Bushwacker's sister-in-law, prompting Bushwacker's own wife to stop talking to him and thereby forcing Bushwacker to retrieve Troy's daughter in order to get his own wife back. While Nomad battled Bushwacker, Troy quickly shoved Legs out of the area for her own safety. Back at Troy's hotel, Legs demanded to know what was going on, explaining that Nomad was a friend of hers, but Troy simply announced that he had a meeting to attend to straighten the situation out. Asking if she was going to be left alone, Legs was thrown money and told to go have fun as Troy left, promising to return around 2a.m. Shortly thereafter, while Troy was at his meeting, Nomad found Legs and ordered her to leave with Bucky, explaining how the Undergrounders had wanted Legs out of Las Vegas and how something bad was about to occur there. Packing up her belongings and Bucky, Legs asked what Nomad planned to do and he simply revealed that he was going to wait for Troy to return and ask him some questions. While waiting for their plane at LAX, Legs was attacked by Bushwacker, who shot Legs and took Bucky. (Nomad II#5) - Having only been grazed by Bushwacker's gunfire, Legs awoke to find herself surrounded by airport security, who insisted that she come with them to file a report and get her injuries looked at. After rescuing Bucky during a separate battle with Bushwacker, Nomad eventually located Legs in the city hospital and insisted that he would get Legs and Bucky to the airport if he had to drive to the airport and carry them onto the plane. Hailing a taxi outside, Nomad ordered the driver to take them to the airport as fast as possible. When the driver took them a different direction, Nomad asked where they were going and the driver revealed himself as the Punisher, who demanded to know Nomad's story. After hearing how Nomad had taken in Bucky from Bucky's crack addict mother to save the infant, Punisher got out of the taxi and told them to get to the airport. Punisher refused to allow Nomad to accompany Legs and Bucky to the airport, however, and once Legs and Bucky were gone, Punisher began fighting Nomad to get a sense of whether Nomad was telling the truth. (Nomad II#9 (fb) - BTS) - The Undergrounders cheated the Pipeline gang out of money, prompting the Pipeline to regain their honor by sending their assassin Ebbtide after the Undergrounders. (Nomad II#7) - The Undergrounder Rockport was captured by the Pipeline gang member Ebbtide and tied to a post underneath the Santa Monica Pier. When Ebbtide asked if Rockport was the Undergrounders' decoy, he admitted that he was but only for the Undergrounders' small jobs. Asking if Rockport was part of the Undergrounders' Venice heist, Rockport insisted that he wasn't but Ebbtide announced that someone had to be made an example of. Ebbtide then pointed a gun at Rockport's head and a panicked Rockport exclaimed that he could help Ebbtide. Ebbtide replied that Rockport helped by sending a message then shot Rockport at point blank range. 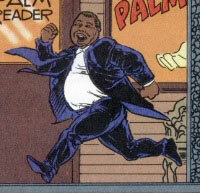 (Nomad II#8) - After Nomad returned to the Undergrounders, they all watched a television report about recent police violence. Not understanding why it was such a big deal, the Undergrounder Polish argued with Horizon, who claimed that minorities couldn't run fast enough to escape the color of their skin and the police's racial profiling. Legs argued back, explaining how she also got harassed often but she wasn't out there throwing bottles at people. Working on another case, Nomad eventually asked to borrow Polish's truck, asking Legs to watch Bucky, and left to continue his work while the Undergrounders continued arguing. During the riots over the police brutality, the Pipeline's Ebbtide found the Undergrounder Pretty Boy carrying a crate of things he had recently looted. Asking if Pretty Boy was a member of the Undergrounders, Ebbtide shot Pretty Boy in cold blood when Pretty Boy replied that he was. (Nomad II#15 (fb)) - The Undergrounders Legs, Horizon and Polish met up at Casey's restaurant. 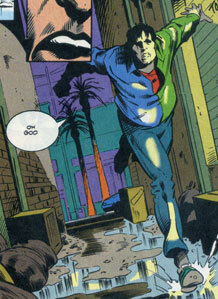 (Nomad II#9) - Ebbtide hunted down the Undergrounder Tenure, who begged for his life and asked why he was being hunted. Ebbtide grimly replied that he had a lesson to teach on not $#%@ing with the Pipeline before killing Tenure. Later at Casey's, the Undergrounders met to discuss Tenure's death. Asking what Horizon predicted for the future, Legs was told that the Pipeline wouldn't stop until all of the Undergrounders were killed. Exclaiming that they weren't a gang like the Pipeline, merely street urchins, Legs begged Nomad to help them against the Pipeline. A reluctant Nomad agreed to help and days later, Nomad admitted that the Undergrounders had placed him in a very compromising position and that he didn't want to make a move against the Pipeline without knowing he was doing the right thing. Horizon asked what more Nomad needed to know but Nomad admitted that he had grown to like the Pipeline. Angry that they would all be killed if the Pipeline wasn't stopped, Legs reminded Nomad that if he didn't act, Bucky might also be killed. Realizing he had to act whether he wanted to or not, Nomad confronted the Pipeline and was eventually forced to kill Ebbtide in self defense. Returning to the Undergrounders, Nomad packed up his belongings and decided to leave their company. A crying Legs kissed Nomad on the cheek and when Nomad asked Horizon if Los Angeles was dying, Horizon could only reply that it was dying a slow death. Nomad remarked that a little more of it had died that day and before Nomad left, Horizon gave Nomad a phone number and told him to give the Undergrounders a call from wherever Nomad wound up next. Nomad then departed. (Nomad II#12 (fb) - BTS) - After staying in Albuquerque, Nomad traveled to Ft. Worth, Texas, where he met up with another group of Undergrounders who got Nomad a job as part of a road crew. When Nomad was injured and required stitches, an Undergrounder doctor named Kildare fixed Nomad up at the Betterdon Clinic, where Nomad ended up getting involved in a violent scuffle between a gay man and an angry, homophobic mob. (Nomad II#12) - Once he had gotten the man to a hospital, Nomad returned to Bouncing Betty's, where he was greeted by the Undergrounders Horseshoe and Ma Bell, who commented that she couldn't understand why Bucky liked Nomad so much when he was constantly unshaven. Horseshoe and Ma Bell asked why Nomad got involved with the anti-gay mob but Nomad only replied that he seemed to get involved everywhere he went. When Horseshoe remarked that Nomad couldn't stop hate, Kildare entered the room and reminded the Undergrounders that they should still try. Days later, the Undergrounders stood guard over the Betterdon Clinic following a court ruling allowing the center to continue operating despite the homophobic mob's attempts to have it closed. When the mob attacked the center, Horseshoe led the Undergrounders in fighting back to protect innocents from the mob. Nomad soon realized that the Undergrounders were acting the same as the mob itself and rushed to a local radio station where announcer Martin Elliot was spouting homophobic banter. Upon Elliot's defeat, Nomad decided to leave the Undergrounders, fearing that if Elliot pressed charges, it would reflect badly on the Betterdon Clinic where the Undergrounder Kildare worked. Kildare suggested a doctor in Dallas where Nomad could get Bucky a checkup and Horseshoe opted to accompany Nomad to Dallas. (Nomad II#16 (fb) - BTS) - Upon traveling to New Orleans, Nomad met up with the Louisiana chapter of the Undergrounders, who paid Nomad to retrieve a family photo from an elderly couple. (Nomad II#16) - Returning to the Undergrounder Bluenote, Nomad returned the photo to the Undergrounders' employer, Antoine Cereste. Cereste paid Nomad, remarking that there was no need to count the money. Nomad warned that if there was a reason to count the money, Cereste would be in for a "cajun catastrophe." Insulted, Antonie attacked Nomad, who easily took Cereste down as Bluenote proudly proclaimed that Nomad was made of brass. Finding it odd that he was hired to retrieve a photo and that Antoine had commented about the woman in the photo could've been his mother despite the photo appearing much older than Cereste, Nomad nonetheless took his money and departed. Subsequently visiting a pharmacy, Nomad was shocked when he heard the price of the medicine. The pharmacist nervously admitted that he had already discounted the medicine because he owed the Undergrounders a favor and that he could go no lower. Later, in the French Quarter, Bluenote happily strolled down the street before his knee was shot by an unidentified assailant, who demanded Bluenote tell her everything he knew about Nomad. When Bluenote grunted that there wasn't much to tell, the woman smiled and announced that there wouldn't be much reason to hold her knife as his throat then. (Nomad II#17) - Two weeks later, after Bucky was kidnapped, Nomad visited the Sad Smile bar and spoke with two Undergrounders about the kidnapping. The Undergrounder known as Ex-Lax asked Nomad what the cops said about the situation but another Undergrounder, Crayfish, smacked Ex-Lax in the head and reminded him that the cops couldn't be involved. Angry at not knowing what he should do, Nomad was soon confronted in the bar by the Favor Banker, who offered to help his "old friend." The Favor Banker promised to give Nomad the name of Bucky's kidnapper if Nomad promised to do a favor for him later. As Crayfish and Ex-Lax watched, Nomad agreed to the deal. Soon learning that it was Bucky's mother that had both kidnapped Bucky and shot Bluenote's knee, Nomad tracked her down, only to ultimately return Bucky to her mother and depart. Comments: Created by Fabian Nicieza, S. Clarke Hawbaker and Mark McKenna. I chose to write this profile only about the Undergrounders. Horseshoe had other appearances after leaving the Undergrounders but that's best left for a full profile on her. 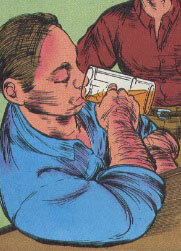 The Undergrounders' appearance in between Nomad II#8-9 was seen via flashback in the infant Bucky's memories when the Hate-Monger possessed her body in Nomad II#15. Bluenote was a member of the Louisiana chapter of the Undergrounders. After meeting with Nomad, Bluenote obtained a retrieval job for Nomad in which Nomad had to retrieve an old photo for Louisiana criminal Antoine Cereste. Upon retrieving the photo, Nomad returned to Bluenote, who was meeting with Cereste. When Nomad made a thinly-veiled threat involving having to count Cereste's money, Cereste became angry and attacked but Nomad easily took down the thug, much to Bluenote's delight. Bluenote was later strolling in New Orleans' French Quarter when he was ambushed by the infant Bucky's mother, who shot Bluenote in the kneecap and demanded to know everything Bluenote knew about Jack Monroe. A member of the Louisiana chapter of the Undergrounders, Crayfish ran the Sad Smile bar, where the Undergrounders hung out. When Nomad's unofficially adopted daughter Bucky was kidnapped, Nomad went to the Sad Smile to talk over the situation with Crayfish and Ex-Lax, during which Crayfish slapped Ex-Lax over the head for asking what the cops had to say about the kidnapping. Crayfish then watched as the Favor Banker arrived in the bar and offered to tell Nomad the identity of Bucky's kidnapper in exchange for a future favor. Ex-Lax was another member of the Louisiana chapter of the Undergrounds. He was present in the Sad Smile bar when Nomad came to discuss the kidnapping of his unofficially adopted daughter, Bucky. When Ex-Lax asked what the police had to say about the situation, another Undergrounder, Crayfish, slapped Ex-Lax over the head and reminded him that the cops couldn't get involved. 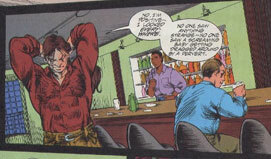 Ex-Lax was still present in the bar when the Favor Banker arrived and offered the identity of Bucky's kidnapper to Nomad in exchange for a future favor. Horizon was the leader of the California chapter of the Undergrounders and had a knack for foreseeing coming events. Despite this, he often sat around and grumbled. Sensing an event about to occur at the Los Angeles International Airport, Horizon passed the tip on to Nomad, who ended up fighting U.S. Agent there. When the Undergrounders were being hunted by the Pipeline gang, Horizon met with other Undergrounders to discuss what to do and when Nomad ultimately was forced to kill the Pipeline's assassin Ebbtide in self-defense, Horizon gave Nomad a number to call when he departed for a new town. Kildare was a doctor member of the Texas chapter of the Undergrounders. He worked at the Betterdon Clinic that helped those less fortunate and stitched up Nomad when Nomad was injured. After a gay man was attacked outside of the Betterdon Clinic, Kildare met with the Undergrounders inside Bouncing Betty's, where he reminded the others that people could still try to stop hate. 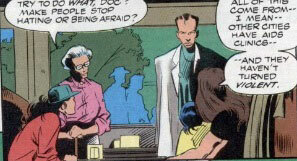 Later, after Nomad decided to move on from Texas, Kildare gave Nomad the name of a doctor where Nomad and his unofficial adopted daughter Bucky could get tested for HIV and other infections. Legs was a prostitute member of the California chapter of the Undergrounders. Seeing the group as street urchins, Legs often enjoyed watching Nomad's unofficially adopted daughter Bucky when Nomad went on missions despite first being wary of Nomad. When she accompanied Troy Donahue to Las Vegas, Nomad followed on behalf of the Undergrounders to make sure she was okay but when Nomad sent Legs and Bucky back to California, they were attacked at the airport by Bushwacker and Legs was grazed by his gunfire. Airport security got Legs to a hospital, where Nomad later found her and tried to get them back to the airport via taxi, only to find that the driver was the Punisher. Upon hearing the story of how Nomad had somewhat adopted Bucky from a drug addicted mother, Punisher allowed Legs and Bucky to continue on their way to the airport. Legs later met back up with Nomad when she met with the other Undergrounders to discuss recent murders amongst their number by the Pipeline gang's assassin, Ebbtide. Begging Nomad to stop the Pipeline, Legs subsequently grew angry when Nomad began befriending some of the Pipeline members. After Nomad was forced to kill Ebbtide in self-defense and decided to leave Los Angeles, Legs kissed him on the cheek and said goodbye. Ma Bell was a member of the Texas chapter of the Undergrounders and seemed to be constantly griping about something. After Nomad stopped an angry mob from killing a gay man outside of the Betterdon Clinic, Ma Bell remarked that she couldn't understand why the infant Bucky had taken such a liking to Nomad, who seemed to consistently be unshaven. Ma Bell later joined the other Undergrounders in standing guard outside of the Betterdon Clinic before it was once again attacked by the angry mob. When Nomad later decided to leave Ft. Worth for Dallas, Ma Bell said her goodbyes as Nomad departed. Polish was an overweight member of the California branch of the Undergrounders. When the Undergrounders were watching news reports on television about recent racial profiling and excessive force used by Los Angeles police officers, Polish admitted he couldn't understand the situation. Polish later joined the Undergrounders when they met to discuss recent murders amongst their numbers by the Pipeline gang's assassin, Ebbtide. Pretty Boy was a young member of the California chapter of the Undergrounders. He was once embroiled in a setup involving the producer of Saturday Night, but Nomad managed to free Pretty Boy from the situation and he returned to the Undergrounders. Often rhyming in his speech patterns, Pretty Boy participated in looting during the Los Angeles riots but was located mid-run by the Pipeline's assassin, Ebbtibe, who asked if Pretty Boy was with the Undergrounders. Admitting that he was, Pretty Boy then asked if Ebbtide also was an Undergrounder but Ebbtide replied "no" and shot Pretty Boy dead at point blank range. Rockport was a member of the California chapter of the Undergrounders and appeared to be a near-duplicate of Pretty Boy, often acting as the Undergrounders' decoy on small theft jobs. When the Pipeline sent out their assassin Ebbtide to hunt down the Undergrounders, Rockport was captured by Ebbtide and tied to a post beneath the Santa Monica Pier. Insisting that he had nothing to do with the Undergrounders cheating the Pipeline out of money and that he was only used on small jobs, Rockport was still shot dead by Ebbtide, who claimed that Rockport would have to be an example to the other Undergrounders. Tenure was a member of the California Undergrounders chapter and was hunted by the Pipeline's assassin, Ebbtide. Despite begging for his life, Tenure was still killed in cold blood by Ebbtide. All other characters mentioned or pictured are ™ and � 1941-2099 Marvel Characters, Inc. All Rights Reserved. If you like this stuff, you should check out the real thing!